The Philippine National Police (PNP) led by its chief Oscar Albayalde is now preparing to arrest Sen. Antonio Trillanes IV anytime. This development comes after President Rodrigo Duterte revoked the amnesty granted to the senator by former president Benigno ‘Noynoy’ Aquino III back in December 2010, a few months after the presidential election. According to Duterte, Trillanes did not file an Official Amnesty Application Form as per certification dated August 30, 2018, issued by Lt. Col. Thea Joan Andrade, stating “there is no copy of his application for amnesty in the records.” In addition, the president ordered the Department of Justice (DOJ) and the Court Marshall of the Armed Forces of the Philippines (AFP) to arrest Trillanes as soon as possible. As a response, Trillanes questioned the timing of Duterte’s order saying it was released when the Senate is now set to investigate allegations against the security agency owned by Solicitor General Jose Calida’s family, accusing them of bagging 10 government contracts right after the latter’s appointment, and that it was published in a broadsheet at the same time that the president is in Israel for an official visit. On the other hand, presidential spokesperson Harry Roque insisted that Duterte’s revocation for the amnesty of Trillanes has nothing to do with his being a staunch critic of the administration. 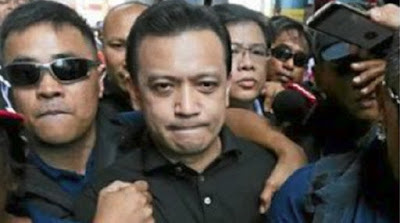 “The past finally caught with Sen. Trillanes. He’s responsible for his current state now. He was the one who did the Oakwood mutiny, the Manila Peninsula siege. There is nothing political.” He said in a press briefing in Israel. Meanwhile, the PNP has not yet announced as when they will arrest Trillaness and where he will be jailed. Nevertheless, there are now PNP-CDIG members outside the Senate apparently waiting for the Senate hearing to be finished, and that the soldier-turned-politician is likely to be arrested as soon as he gets out the Senate hall, and that he may be jailed at the PNP Custodial Center in Camp Crame, alongside with Liberal Party (LP) Senator Leila de Lima and Senator Ramon ‘Bong’ Revilla Jr.